This week we were discussing SENSORY SPECIFIC SATIETY in our psychology class and.. I find it fascinating! Sensory specific satiety (SSS) basically means you get tired of the taste&texture of food (studies show it happens even if you don’t swallow the food; thus it is not about getting full on calories). To be a bit more scientific in my definition: “as food is consumed, its pleasantness declines while that of other foods remains relatively unchanged”; this phenomenon of SSS leads to the termination of eating a particular food, while promoting the selection of other foods. So after being destructively full after a large meal..many would suddenly find “space” for a dessert. So truly, this is a great adaptation, because it motivates us to eat a variety of things. 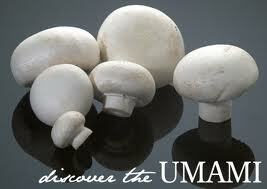 It also means that, if our meals has a large variety (in its texture & flavor) we tend to eat more. This is not particularly useful, though, in an environment where delicious food is available 24/7 and one looks to maintain a healthy weight. Think about many sauces or salad dressings that combine both strong sweet and salty tastes (thus, making sure we don’t get satiated as soon..and probably eat more). SSS seems to work well with fats and proteins, but not so much with basic starches. What this means is that people don’t get sick of eating bread, pasta, and other starchy carbs over time. So far I talked about short-term SSS, or satiety with one meal; however the same is true when the same food is eaten over time (i’m sure you’ve experienced this- if you keep eating the same thing daily you might get tired of it), even though long-term SSS is more complicated. The study I read*, for example, looked at eating high energy-dense snack foods for 12 weeks (hazelnuts, chocolate, potato chips). While people’s sensory-specific satiety decreased (they liked them less) over time, the desire to eat these foods didn’t…and intake increased. So habitually eating high calorie snacks could lead to higher energy intake of the snack and weight gain. You don’t really want to have a low threshold for SSS- that means you don’t get sick of foods and may overeat them more. Why I find this interesting? 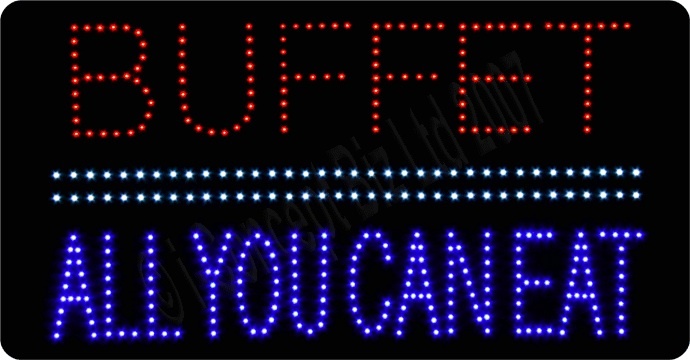 It makes me think of dieting…most dieting restricts something– carbs, fats, certain ingredients (gluten; dairy). When people see weight loss, perhaps it is because the more narrow range of foods leads them to quicker sensory satiety and then overall they just eat less? Many diet plans emphasize calculating calories is not important, as if you can eat way over your limit and not gain weight..but perhaps you naturally are lead to consume less because of the monotony of the diet? Another thought I had- mono-eating= eating one food at a time until you are food. The idea is- it is better for digestion, but also- looks like you would limit your food intake much more naturally (with less effort) when not having a variety in one meal. Overall, I think this is quite interesting. While we want a healthy variety in our diet, we probably want to concentrate it on the vegetables and other healthy foods we don’t get enough of. Variety in ice-cream and chip flavors is probably not essential at this time and age. *Tey, S. L., Brown, R. C., Gray, A. R., Chisholm, A. W., & Delahunty, C. M. (2012). Long-term consumption of high energy-dense snack foods on sensory-specific satiety and intake. The American journal of clinical nutrition, 95(5), 1038-1047. *** for more info on SSS, search for papers by Barbara Rolls. Some people claim they “crave” protein in their food to feel satisfied… others say it is really the fat that they are after. Do we really crave protein? Can we even “taste” protein in itself? Glutamate is found in both animal and plant foods; in almost all protein-containing foods (fish, meat, poultry, eggs, cheese), many vegetables (ripe tomatoes, cabbage, maize, green asparagus) and for humans & chimps, in mother’s milk. In addition, glutamate is produced by our bodies and binds with other amino acids to form structural proteins. If you’re at all into health, the word “glutamate” has probably evoked some negative connotations. Or- monosodium glutamate- the evil MSG. While umami exists naturally, MSG is a additive (extracted glutamate mixed with salt) which has become quite unpopular in the 90s due to health concerns (for health issues, please google MSG; that’s a whole other topic). If you use MSG, you taste umami, but umami does not contain MSG (MSG on its own does not taste good but enhances flavor of other foods). I suppose the original idea was to add umami-tasting MSG to healthy but often disliked foods such as bitter vegetables to increase their intake…of course now you find MSG in many processed nutritionally poor products (it’s probably not too great to increase our liking of those foods). In conclusion….can we crave protein specifically? Indeed it seems so. 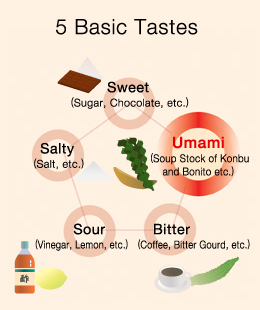 The study I reference at the bottom argues that the taste of MSG maybe one of the compounds that represents the taste of dietary protein…this “meaty” umami taste appears to predict the liking and preference for high protein foods. Today was the second day of the healthy lifestyles conference organized by Arizona State University and I was very much impressed by the vegetarian speaker! Actually, I know the professor, Carol Johnston, since I am involved with her vegetarian study..but this is the first time I heard her talk on the subject. Studies showing fantastically superior health of vegetarians do so due to comparing vegetarians to national averages (which are not so great). When vegetarians are compared to meat-eating groups who also follow healthy lifestyles, the difference in health is not as prominent. 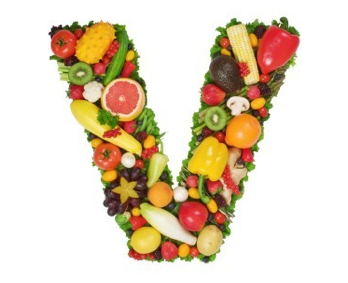 Some important things to consider with vegetarian and vegan diets is B12 and Vitamin D (also zinc, calcium), since these populations do tend to be low in these vitamins. Dr. Johnston herself raised her two kids omnivorous, since she has concerned with a number of studies showing dangers of low B12 in small children. Indeed, during pregnancy one’s B12 decreases as well. 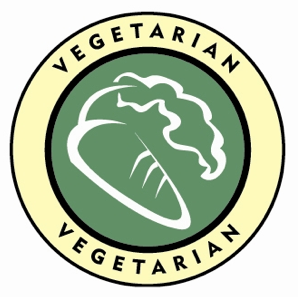 Some of the well-accepted benefits of vegetarian lifestyle are lower risk for colon and breast cancer. Of course, Dr. J discussed the ecological piece and the importance of diminishing one’s intake of animal calories for those reasons. I found it fascinating that once an audience member asked a question about recommending vegetarian diets to lower SES communities, Dr. J answered that she understands we have evolved on meat and we were meant to eat it, but in this day and age with disease, environmental issues, and low animal product quality (+ horrible animal treatment) vegetarian diets in her view are a better solution (but one might need to be a grown person to adopt it). She would not recommend going vegetarian in the 3rd world countries. I loved the last comment, because my observation has been that people try very hard to prove our ancestral diet was vegan. It seems to be not so, but I don’t believe this fact is a reason against vegetarianism. I think Dr. Johnston’s view is very rational- you do not have to sell the vegetarian diet as the most original and natural for our species (it is not as evidenced by deficiencies due to animal product avoidance), you simply need to concentrate on the fact that this diet might be much better for you personal health, for the environment, and the animals. Is there anything more exciting than a health conference??? Well, there is always chocolate, but the conference excitement is quite comparable. Arizona State University has organized a great conference “Nutrition for Optimal Health and Performance”. Today’s lecture included speakers on athletic nutrition, debate on the High-Fructose Corn Syrup, and Paleolithic Nutrition. Right now I shall focus on the Paleo presentation. 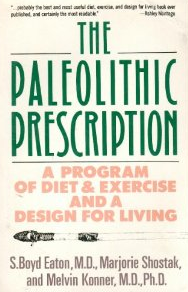 S. Boyd Eaton, MD from Emory University is considered the “father” of the modern paleo movement (you would know him from the Paleolithic Prescription book). He himself considers himself the “grandfather” since much of his original ideas have been somewhat transformed by other (younger) researchers (and he does not necessarily agree with all). The presentation was not new to me, since I have read several of his papers. In short, Dr. Eaton talked about the basis for the paleo health idea- the “discordance hypothesis“, according to which our genes and our lives are discordant (we adapted to a certain food and activity pattern, which is not matched by the modern sedentary/processed foods lifestyle)… The mismatch of the current obesogenic environment and our stone age genes are the reason we suffer from “western” diseases. The human of 40,000 to 15,000 years ago is fundamentally identical to the modern human. 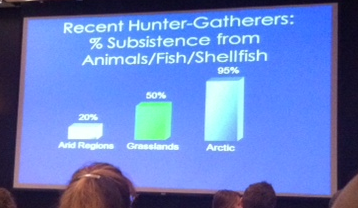 Then Dr. E talked about different % of meat subsistence of recent hunter gatherers which ranges from 20% animal products to 95%. They/anthropologists take the 50% of animal protein in the diet as the model due to the idea that most of us come from the savanna region of Africa (with 50% animal dietary intake). He also discussed that anthropologists have rather good ways of studying old diets (human skeletal remains, archeological finds, recent hunter-gatherers, and proximate nutrient analyses). The Paleo-Nutrition of East Africa (~50,000 years ago) is considered to be comprised of 35%, 25-35% protein, and ~35% carbohydrates. Of course the carbs, protein, and fat of long ago and the present day are not the same (obviously, less processed and more micronutrient rich; the fat was more polyunsaturated, more long chain PUFA, and less cholesterol-raising fat). Other noted differences – vitamins and minerals were 2-8 times higher than average American intake; much higher potassioum-to-sodium ratio, the diet was more basic than modern acidic diets, and much more antioxidants than at present (generally 4x). Dr. E especially emphasized fiber- vegetables in the wild are much more fibrous. Lastly, the energy intake was considerably higher, but caloric density was low (there was more bulk- more fiber, more water in food). Dr. E also talked about “free water intake”- most of the fluids consumed were part of the vegetables&fruits. The strong form (which seems to be the popular form as I can tell from talking to folks) is for people with “resistant health problems or who are unable to maintain desirable biomarkers” + competitive athletes. This diet is what you would usually recognize as “the paleo diet”completely excludes grains, dairy, and alcohol. The most exciting part for me was listening to Dr. E talk to a group of people after the presentation. 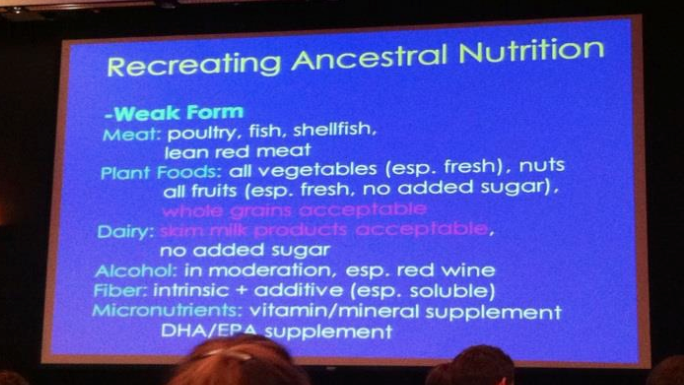 A dietitian asked about the lack of legumes and beans in the paleo diet (she was upset about such nutrition advise). He commented that this was not something he necessarily agreed with at all, and that this idea originated with a different researcher (sorry, I can not remember who). My friend asked how he viewed a paleolithic diet without meat (she is mostly vegetarian). He said his understanding of meat avoidance is very much justified on ethical and moral grounds, considering the treatment of animals and their health (thus, the healthiness of their meat). And if one could get their protein adequately from other sources that was great too. So he was not particularly married to one type of the ultimate human diet. Overall, Dr. E was a pleasure to be around. Another dietetics student, who I know is a vegan since we are both involved in a vegetarian study, asked how he would respond to the massive literature on the health benefits of vegetarian diets and the problem of saturated fat from meat. Dr. E “politely disagreed” that vegetarianism was necessary for health but did not elaborate as much as we hoped. I understand the doc does not view being vegetarian as necessarily more healthy (considering you could do paleo with grass-fed free range meat and all). But I also wish he could talk about this further. 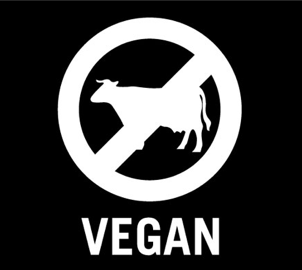 As someone who was vegan for 2 years and is very familiar with various health rationales for avoiding animal products, I have come to the conclusion that it is not necessary to exclude these products from the diet for health. Many cite The China Study by T. Colin Campbell, which is a book I also used to refer to (in brief, it shows the connection between animal protein and cancer). However, after looking into people who eat “traditional” diets (e.g. the Weston A. Price foundation diet), and seeing the vibrant health they enjoy… I had to come to the conclusion that all is not as black & white as I expected. In regards to meat & cancer, I am fascinated by new information on mTOR. Since I plan to post about mTOR in depth later, I will only say that it is a pathway that can be up-regulated if excess protein levels are detected in the body…in turn this stimulates cellular proliferation and adverse mitochondrial effects. In short- too much protein= increased risk of cancer. But note here that animal protein only in excess leads to adverse health effects, not animal protein per se. Supposedly, 45-60 g of protein per day for the majority of adults is a good amount* for longevity and avoidance of disease. It was a pleasure to actually talk to the originator of the “paleo” movement, who himself is very balanced and rational in contrast to how the idea can be taken to extremes by many different people. The one thing Dr. E said is that obviously it is not sustainable for everyone to eat a paleo style diet any more, unless we decreased the world’s population drastically. Obviously, that is a different talk altogether. *Gedgaudas CNS, CNT, Nora T. (2011-05-27). Primal Body, Primal Mind: Beyond the Paleo Diet for Total Health and a Longer Life (p. 196). Inner Traditions Bear & Company. Kindle Edition. Sometime in the semester, I heard people speak about satiety (satiation is the process of feeling full & terminating food ingestion during the course of eating) in relation to protein and fat (protein apparently is more satiating, even though fat has more calories). Feeling of fullness is important- it is one of the problems I faced as a raw vegan, which made sticking to the lifestyle very hard long-term (I was raw vegan for ~2 years). Most importantly- it’s not all about the calories, since not all calories are treated equally by the body. The hierarchy of fullness is the following: Protein > Carbs > Fats. So, protein satiates more than carbohydrates, and fat is least satiating (which came as a surprise to me considering it has most calories per weight). High-fat foods have a weak effect on satiation. Within the macronutrient categories, we find differences too: not all carbs exert the same effect on satiety (fiber has been consistently shown to have a higher satiety value vs. simple sugars), and neither does fat (the medium-chain triglycerites [e.g. the wonderful coconut oil] seem to be more satiating). According to the article*, ideally our diet would consist of low-energy-dense foods with high palatability (unfortunately such foods are not very common). This “diet” is one low in fat, has adequate protein and fiber, and includes lots of fruits, vegetables (so food with high water content). Of course, focusing on whole foods vs. processed makes lots & lots of sense- a whole food product takes time to chew and digests longer (satiety signals are maintained for longer). Apart from specific studies, common sense must prevail: staying away from “fat” is not necessary (not as much as staying away from processed fat, vegetable oils, etc…), and adding great fats (e.g. avocado!) to meals is both healthy and filling (studies show that while fat on its own is least satiating, it’s power to fill us up increases when it is added to carbs). Feeling full is important! Constantly feeling deprived could potentially lead to overeatingand more stress. Could SPICY FOOD make you HEALTHIER!? While spicy foods are not particularly pleasant to the taste (the sensation they can create can be even that of pain) many people love spicy food! 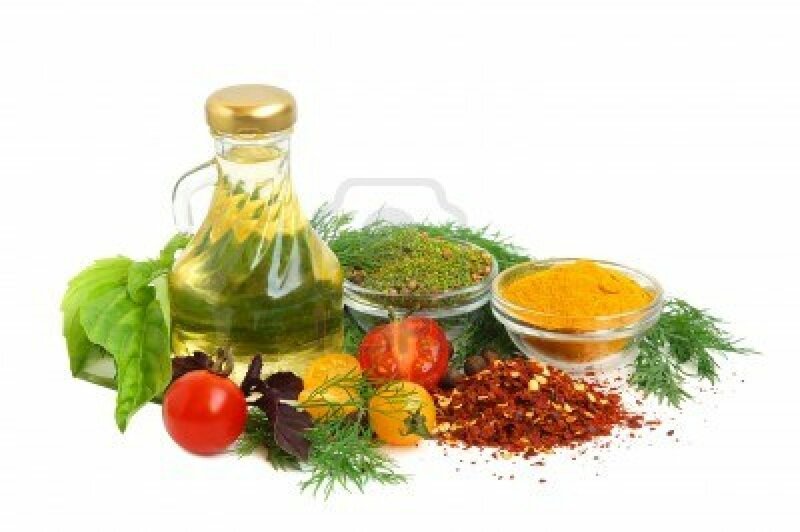 Indeed, spices have been highly valued and fought for throughout history! So other than enhancing the taste of food, perhaps there are other more potent reasons for their importance throughout the world? I’m reading a fascinating study* on the subject, and the authors hypothesize that adding spices to food is beneficial since they contain substances that inhibit or kill food-spoilage microorganisms (we know certain spices have antioxidant & antibacterial properties; others are powerful fungicides). In short, the authors looked at traditional cookbooks, spices used in meat-based dishes, and country’s climate (since meat products in hot temperatures would spoil fastest). The most used spices for the ~4,580 recipes analyzed were onion and pepper, followed by garlic, capsicums, lemon/lime juice, parsley, ginger, and bay leaf. The average spice was found to inhibit ~ 67% of bacteria (garlic, onion, allspice, and oregano inhibit EVERY bacterium they’ve been tested on!). It was found that more powerful spices were used more frequently in hotter climates= recipes from those countries have more antibacterial potential! Lemon and lime juice use appears to be strange- it is used a lot, while it has one of the lowest effects against bacteria. These juices, however, are syngergists (as well as pepper)! They act synergistically to enhance antibacterial effects of other spices. Now as I was reading this, I thought- maybe hotter countries simply have more spices growing there? The authors found out that there was no relationship between a country’s mean annual temperature & number of spice plant species growing there. Another problem I imagined- what about cooking? Perhaps heat destroys some of the antibacterial and other effects of spices? Turns out spices are thermostable and have similar effect even after steam-distillation. INTERESTING fact I didn’t know- plant secondary compounds & essential oils can contain mutagenic, carcinogenic, and allergenic effects.. and while protecting oneself from food-borne illnesses outweighs the dangers of these chemicals, it would explain why kids and some pregnant women might dislike spices. [in the modern obesogenic food environment with french fries and twinkies, potentially negative health of spices should not be on top of our concern list]. Also important- medicine is pretty much a low dose of poison…so spices have been used to counteract ailments of all sorts (e.g. garlic for pneumonia, worms, etc). Animals are capable of self-medicating with strong-tasting vegetation as well. * Billing, J., & Sherman, P. W. (1998). Antimicrobial functions of spices: why some like it hot. Quarterly Review of Biology, 3-49.